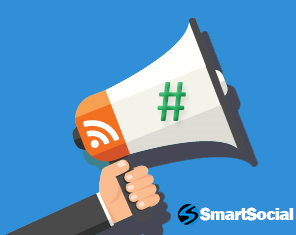 SmartSocial’s social media management software has recently released an update which will enable you to randomly insert hashtags to your social media posts when using the SmartSocial RSS Auto Poster. This will automatically push content updated on a particular RSS feed to your chosen social media channels. It’s now been cited more times than some can count, the research on Twitter hashtags can’t be overstated. According to it, tweets with one or two hashtags doubles the chances of engagement. Be careful though, because if you exceed two hashtags in a tweet your chances of engagement actually drop by 17%. There’s a fine line between 2 and 3 with Twitter hashtags. It’s also important to note how “engagement” is defined in this research. Only 22% of engagement with a brand’s tweets are replies. However, 78% are retweets and a whopping 92% are link clicks. So if you include an appropriate hashtag or two in your tweets as a brand, you are massively increasing the chances of exposure and click-throughs on the site. How to randomly insert hashtags into RSS feed posts? 3) Create a list of hashtags you would like randomly inserted. Place this list in the ‘Advanced Options’ section into the Prefix and/or suffix section during your RSS Auto Poster setup. Ensure that hashtags are sufficiently broad and correctly align with the content you are trying to promote. The purpose of this is to make sure your posts are discovered on social media, so think of categories that may be relevant to your content.